I hope your final full month of summer has been filled with fun and opportunities to take time to relax and enjoy a slower pace. An August highlight for me was spending lots of time with some of my dearest friends, Bill and Terri Aberg, when my husband Steve and I had the opportunity to vacation with them in conjunction with celebrating Steve’s 50th birthday. Our eight days in Oregon included incredible dining experiences, running the Bridge of the Gods Half Marathon (the most beautiful and hilliest course I have ever run), mountain biking, sampling the state’s best beer, hiking, and blue cheese-pear ice cream. The best part of the trip was getting to hang out with three of my favorite people in the world. Speaking of favorite people, we are thrilled to feature Glen Fladeboe of Fladeboe Auctions in this month’s newsletter. Glen and I met and began our partnership in 2007. Today, Fladeboe Auctions works with Ann Plans on many of our events, and I consult with close to 60 of Glen’s clients each year on fundraising strategies. With the busy fall gala season quickly approaching, timing seems perfect to highlight one of the best in the business. Glen Fladeboe has worked as a professional auctioneer for more than 20 years. In 2015, Fladeboe Auctions helped nearly 260 nonprofits and educational organizations raise over $21 million. What are the top trends you are seeing in local fundraising events? Over the last five years we have seen continued growth in mission-based giving in the fund-a-need or direct giving opportunity. We are seeing less focus on elements such as décor and more focus on the content of the program that will move guests towards greater connection with the organization’s mission. What strategies are most effective in growing attendance? Clients that are most successful in significantly growing attendance work through an engaged Board of Directors and/or event committee where there are 15-20 people committed to filling a table and recruiting at least one other person to work on filling a table. Another great strategy is extending personal invitations to generous annual fund supporters. How can organizations most effectively grow event revenue? Doubling or tripling revenue seldom happens overnight, and it is usually the combination of several factors that contributes to significant growth. Some of the best strategies are securing better quality live auction items, having more people in attendance who have giving capacity, and identifying donors who are prepared to bid high on live auction items or start the fund-a-need giving at a leadership level. How many and what types of items do you suggest organizations target for their live auction? The trend has been towards smaller live auctions with highly desirable items that help build momentum for strong giving in the fund-a-need. For the majority of the events we do, 5-7 live auction items is the right number. In-home dinners remain the hottest item as a general category. We advise clients to focus their live auction on culinary experiences, vacation packages, and other unique experiences. What is the most exciting live auction item you have sold recently? I recently sold a dinner with the CEO of Best Buy for $40,000. The CEO was willing to sell the dinner three times, so we raised $120,000 through that single item. This individual is very well-liked which added greatly to the perceived value of the item. Having at least one relationship-based item in a live auction can be a great strategy. What are the biggest mistakes you see organizations make that impact night-of event revenue? Organizations that have the best outcomes are super intentional about both the length and messaging of their program. When a program doesn’t have clear, tight and inspiring messaging, fundraising will be less effective. Our ability to be successful with the live auction and fund-a-need decreases when these fundraising opportunities take place later in the night because the program ran long. How can organizations maximize giving through a fund-a-need? 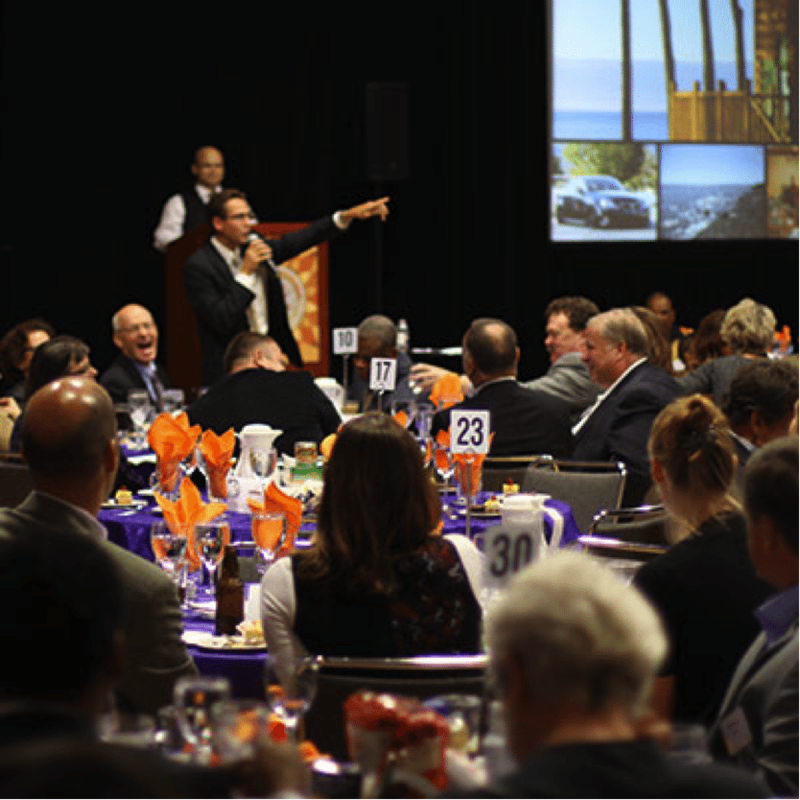 The fund-a-need or direct giving opportunity is raising about 70-75% of the revenue at our clients’ events with 25-30% coming from the live auction. For this very important giving moment, it is important to clearly communicate what the dollars are being raised for and how the revenue will make a difference. Having donors pre-committed at the top giving levels is super important. We are thrilled to welcome Kjerstee Miller as the newest member of the Ann Plans team. Kjerstee has over 10 years of nonprofit and corporate event experience. She started her career in the nonprofit sector, and most recently worked with Gigi’s Playhouse Twin Cities this summer on Cody’s Dash 5K. For seven years Kjerstee served as the Meeting and Events Manager for Great Clips coordinating events and conferences for as many as 3,000 attendees. Outside of work, Kjerstee enjoys spending time with her wonderfully busy 2 young children and amazing husband. A passionate foodie, Kjerstee enjoys bringing people together around the sharing of meals. The Ann Plans team wishes you an enjoyable close to your summer, and we look forward to sharing in a successful season of fall events filled with generous and inspired giving.